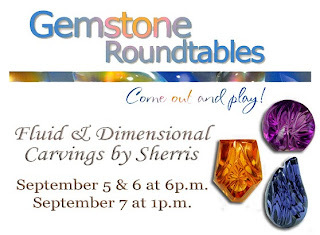 Support PAL at Upcoming Gemshow Roundtables! A unique opportunity to support PAL while enjoying an evening out. Christopher's Fine Jewelry Design has graciously offered to donate $15 for every person who attends their upcoming Gemshow Roundtable to PAL. In addition, they will donate 10% of the sale price of all gems purchased by PAL supporters (just let them know that you would like your purchase to support PAL). If you've never enjoyed this unique event before, here's what you can expect. Gem dealers from around the country are invited to bring their collection to a dinner party setting at Christopher's. On September 5-7, Sherris Shank , a renowned gem carver, will bring over 200 carved, colored gemstones. You and a limited number of guests will be escorted to the gem room where the table will be set with flowers and refreshments. Each stone will be passed around the table allowing you to handle each and, if you love it, keep it at your place setting. At the end of the evening you will have the opportunity to purchase stones directly from the dealer and Christopher can do a quick sketch to show you how the stones might be incorporated into a custom piece of jewelry. Shows last approximately 3 hours and there is no pressure to buy. The only expectation is that you have fun. The cost for this special event is $15 and reservations are required. Call the store at 352-2415 and let them know which show you would like to attend and how many people you are bringing. Also, let them know you heard about this from PAL. This is a great date night or girls night out! Public Art League is proud to announce the installation of The Shield of Chichen Itza, a sculpture by James K. Johnson. 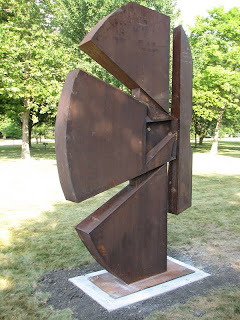 The sculpture was installed, with assistance from the Champaign Park District, on Wednesday, August 28th in Morrissey Park, 1400 Windsor Road, Champaign. The Shield of Chichen Itza represents the 34th sculpture Public Art League has brought to the community, and its installation is possible thanks to the generous support of the Champaign Parks Foundation. James K. Johnson, the sculptor of The Shield of Chichen Itza, is the former Dean of the College of Arts and Humanities at Eastern Illinois University. He has received six grants from state and local institutions to develop glassblowing and bronze casting facilities and was selected as one of five sculptors to participate in a research project at the University of Costa Rica. As an artist, he has participated in over 60 regional and national juried and invitational exhibitions, and completed numerous large scale outdoor sculptures in aluminum and cor-ten steel on exhibit in Kansas, Illinois, Arkansas, and Indiana. The Public Art League is proud to announce the installation of Sunder Planet, a sculpture by Stephen Luecking of Chicago. 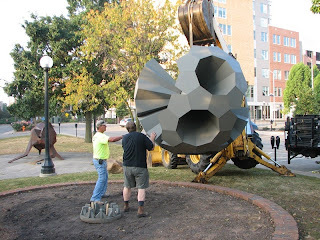 The sculpture was installed in the planter bed in the Orpheum Children’s Museum's parking plaza in downtown Champaign. Sunder Planet represents the 33rd sculpture the Public Art League has brought to the community, and its installation is possible thanks to the generous support of The Robeson Family Benefit Fund. 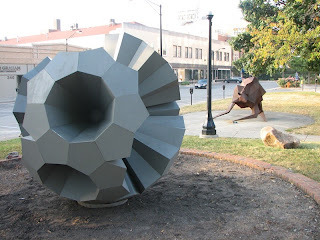 Stephen Luecking, the sculptor behind Sunder Planet, is a Professor at DePaul University’s School of Computing and spent 25 years in DePaul’s Department of Art and Art History. During that time, he participated in nearly 150 exhibits, 20 of which were one-person shows. He is the author of several articles, essays, and reviews which have appeared in national and international art journals, as well as the book Principles of Three-Dimensional Design: Objects, Space and Meaning. With Sunder Planet, Luecking demonstrates “mathematical art”. Instead of using the elegant symmetries of spherical polyhedrons to create a closed surface, he has made simple adjustments in the proportions of the polyhedrons to create a piece that breaks the symmetry and creates interacting masses and voids. Yet at the same time, the piece retains much of the symmetry’s original appeal.